Make and handle invoices, estimates and received bills. Made for entrepreneurs not accountants. Basic plan is FREE. Plus is just $9 / month. 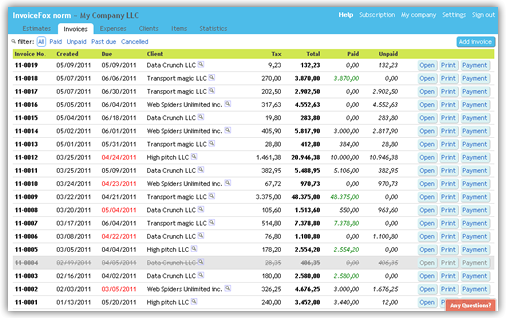 Gives you Invoicing, Payment management, Clients, List of Items/Services and Statistics. try our service absolutely free for 30 days! "thanks for prompt support and for fixing my problem, impressed"
"InvoiceFox is great! I was using Excel for this now. So glad I found you guys!" "Hey, this service is really fast and simple, exactly what I was looking for."